Sean Muldoon and Jack McGarry, the owners of New York City’s Dead Rabbit Grocery & Grog, have partnered with Danny Meyer’s Union Square Events to open GreenRiver in Chicago today. 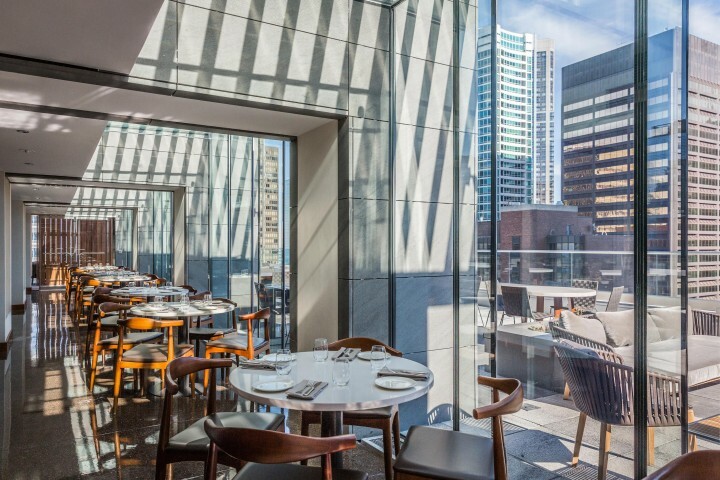 The venue is located on the 18th floor of a building in the city’s Streeterville neighborhood and includes a restaurant, bar, private event space and outdoor terrace with views of the city skyline and Lake Michigan. Operating as the consulting firm The Best Bar in the World, Muldoon and McGarry tapped The Aviary veteran Julia Momose as GreenRiver’s head bartender. Together, they created a cocktail menu that’s organized into eight sections: Rye, Corn, Barley, Agave, Wheat & Oat, Sugarcane & Molasses, Grape & Apple and Juniper. Each category features four cocktails named after Irish-American Chicagoans, such as the Teddy Bear, named for gangster and gambler James “Hot Stove Jimmy” Quinn. The drink is made with fig-infused Powers John’s Lane Irish whiskey, Pimms No. 1 liqueur, lemon juice, ajwain-honey syrup and Dr. Adam Elmegirab’s Dandelion and Burdock bitters, with a grated nutmeg garnish. Another concoction is the Head Honcho, named after police chief and musicologist Francis O’Neill and comprising North Shore Private Reserve aquavit, Dolin Dry vermouth, Dolin Génépy liqueur, Bittermens Citron Sauvage liqueur and caper juice that’s been fortified with St. George Citrus vodka (cocktails are $13 to $19). GreenRiver also offers a wide selection of American, Irish, Scotch and Japanese whiskies and other spirits ($8 to $240), as well as highballs ($11), house-made sodas ($6), wine ($9 to $26 a glass; $36 to $144 a 750-ml. bottle), bottled beer and cider ($6 to $65, sizes vary), and 12 draft beers, primarily from local breweries ($8 to $12). Chef Aaron Lirette created the food menu, which incorporates seasonal ingredients from local purveyors into such dishes as smoked whitefish tartine with egg, radish and celery and sturgeon with bean ragout, turnip and kale (most food is $6 to $28). The venue’s design features custom wood slat and screen walls, solarium niches, a copper-paneled bar with antique oak bar top, and an open kitchen. A private space called the Gallery at GreenRiver can be reserved for events.